Last year, I and millions of other followed the space adventures of Canadian astronaut Chris Hadfield. As Commander of the International Space Station, Chris made it his job to share the space experience with those of us who will never get more than a few feet off the Earth's surface. His photos showed our planet's captivating beauty, and his videos of life in space made everyday activities like shaving, brushing your teeth, or even crying truly fascinating. 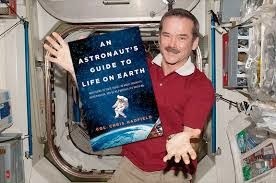 I recently read Chris's book, An Astronaut's Guide to Life on Earth. In the book, he shares many of his space adventures, but he also shares the unique life of an astronaut. The book is filled with inspiration and life lessons, so I started thinking, "What can this book teach me as a musician and worship leader?" For the next few weeks, I'll be writing posts inspired by this book. As a personal disclaimer, I'll say that I don't know anything about Chris Hadfield's personal faith or religious practices, and I don't mean to imply anything about them through this writing. But I would hope that these posts actually fit the original intention of Chris's book - to take the extraordinary experience of being in space, and apply it to life here on Earth. space flight tends to reinforce it." "When we're leading people in worship, are we reinforcing their belief system?" There are many reasons people go to church or attend a night of Christian music, and one of them is to reinforce their beliefs. They want to know that this story, this thing they've committed to, is true. In ministry, we can obsess over 'reaching the lost' and 'saving souls', but the entire faith journey is so important. Once we've 'reached' and 'saved,' what then? I believe one of our roles as worship leaders and Christian artists to bolster the faith of the faithful. Average attendance in today's church is once every two to three weeks. In between those visits, a lot can happen to shake someone's faith - anything from a family illness to a horrible news story to a personal failure can put a crack in their faith foundation. They're not 'lost' again, but they might be looking for the back door. In that moment, we have a responsibility to help them reinforce the faith they have. From our song choice to our prayers to our conversation at coffee hour after the service, we can use all the colours on our palette to remind them of God's love, forgiveness, and mercy. We can never make someone believe or force them into faith, but by demonstrating God's love, by creating community, and by drawing them into honest and beautiful worship, we can remind them of the grace they've already found. our wonder, our transport, when Jesus we see." How are you reinforcing the faith of your worshiping community? Thank you for bolstering the faith of the faithful :) with your faithfulness!